Some of you haven't heard back from me about whether or not you got a pincushion kit. With this funeral, I haven't had time to answer all my e-mails. So, don't despair! Some of you will still be getting some! I'll keep you posted. In the meantime, I hope you enjoy this guest post! The Delighted! Launch Party October 19 was well-attended by the quilting community, from Utah State Fair Quilt Competition winners and top executives of fabric manufacturers to leading bloggers and many more. 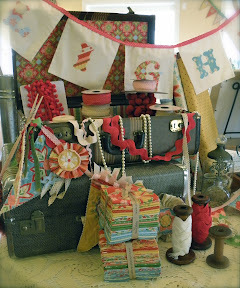 Amanda Herring’s amazingly decorated event was impressive by all counts! - while other stations provided opportunities to create mini pin cushions, charm necklaces, and photobooth photos. And Sew it Goes wrote, "What a joy to see the creativity that went into this fabric line and the great ideas that became of it. This was a party like none other. Amanda Herring was the designer behind this line, and she just shined last night." April Cobb of And Sew it Goes features photos of her perfect little mini cushions in her post - you can see Cobb's skills and sewing heritage! Jana Lee Kigen (pictured below left, standing) of Adventures of a Cross Stitch Drama Queen and The Quilted Fish Design Team taught the mini pin cushion "make and take" craft. Riley Blake Designs also blogged about the event's success, "Amanda knows how to throw a party and her fabric creations inspired everyone in the room. 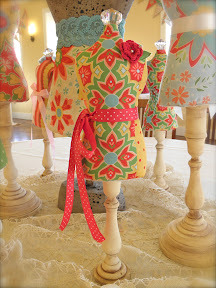 If you missed this event we will show many of these items at Quilt Market." Riley Blake's Blog also features the mini pin cushion make and take - a fun and easy craft that also shows off skill and talent! All Things Belle blogger Jennifer Rodriguez was one of the first bloggers to post after the event. She wrote, "Last night [Amanda Herring] threw a party launching her new line, Delighted. And yes it is *delightful*! The colors are cheerful and bright. I have tons of ideas and can't wait to get my hands on it! Oh and the party? Shear delight...." She shared many great pictures of the event, but one of my favorite pictures of her is in the front row of the last picture of this post! Amanda Herring's hospitality was enjoyed by all, and the evening left us in awe of her creative depth. Not to let us think for a moment she takes herself too seriously, Amanda's own coverage The Party...and the After Party reflects her trademark wit. These are my favorite Delighted things! Aunt Pea, aka Kristin Witzenburg, is a senior consultant with TTYL Publishing. She is an internet marketing specialist and her clients include Peas in a Pod and The Quilted Fish. Are you participating in the Little Forest Quilt Along? Mama Pea and I set up social networking tools to enhance your fun and enable greater sharing with others. You can follow what everyone's doing with the Little Forest Quilt along, even if you aren't participating. To stay up-to-date follow the Little Forest Quilt Along at any of the following options. Subscribe to Feed: Pick any of the options below and click the link to follow through that method. Since we started the feed yesterday 341 people have viewed it. Take advantage of the powerful marketing benefits of social networking to expand your own blog readership! Add your photos to the Flickr group, which will be pulled into the feed if set to public. 3. Go to design in your blog settings. 5. Search under modules for "Embed Your own HTML" and add the module to your side bar. 6. Paste the code you copied earlier into the HTML box, click "save." 7. Preview how the widget looks on your page. If you like it, save and publish it. 8. Once placed you don't need to update it - the Little Forest Quilt Along will update automatically as new posts and photos are published by participants. This is Mama Pea. A huge thanks to my sister (Aunt Pea) for setting all of this social media up for us. She designed the logos, set up all the feeds for us, and wrote this guest post to explain it all for you. It took her quite a bit of time, and I really appreciate it! By the way, she has a degree in Internet marketing, so if any of you need help with your blogs (making new mastheads, adding these kinds of feeds, designing logos and buttons, business cards), she would love your business. Hope you're all coming along well with your Little Forest Quilt. Looking forward to seeing all your updates! Free Little Purse Pattern on Quilted Fish! Happy April Fool's Day! Have you gotten anyone with your tricks yet today? I'm not very good at it. My boss got me good this morning with an e-mail. It's nice to have a boss with a sense of humor! Well, this is no foolin! My tutorial is posted today! Click here to go read it! (You can also download a PDF file of the tutorial there. I'll also be posting the PDF file on my Tutorials tab!) Below, I've got some photos of the finished product and different variations on it. I hope you like it! Are you ready for the big reveal???!!! I'm so excited, because I have am guest blogging today over on Amanda Herring's blog, The Quilted Fish! It all started with this...Amanda sent us some of her beautiful Sweet Divinity fabric, along with some fun buttons and crocheted flowers. She challenged each of us to make/design something with the goodies and to write a tutorial for you. Well, here is what I came up with! Now, this is no foolin'! Here it is! I am so excited that this, my very first Quilted Fish tutorial, is posted today! Please go check it out! This is a tutorial and pattern for a little purse I made for Sweet Pea to hold her Nintendo DSi that Grandma and Grandpa gave her for Christmas. I made the pattern and wrote the instructions. I hope you all like them! And don't despair! If you don't need a DSi case, you can easily modify this to make it a small run around purse for yourself, or you could use it as a camera case or a case for your MP3 player! I am forever indebted to Lynn (Alamosa Quilter) and Jill, who test sewed my pattern for me and gave me awesome feedback. Thank you so much, ladies! They also sent photos of what they created so you can see their versions of the project. I also have yet another version of the project for you to see. Here is Lynn's version of the case! She made it for her son's DSi out of Pokemon fabric. She left the strap off, since that made it too girly. Here's the inside. Lynn suggested that there are other ways you could make the pockets so as not to use girly lace. I tried this and have provided some instructions this adaptation below. Thanks for the idea, Lynn! You can see she also used Velcro instead of a parachute buckle for her closure! Lynn, thank you so much for giving this a go and helping me out! And this is Jill's version. You can see that Jill used Velcro also! She used a cute button on the front to cover where the closure is. Here's a photo of her sweet girl wearing it. She had received an MP3 player for Christmas, so she's using it as a holder for that. She is apparently enjoying it! Here is another version I made. This time, I did some machine embroidery on the flap. To do this, I traced my flap pattern on the front flap fabric with a water soluble pen. Then, I positioned my embroidery where I wanted it to go on the flap. I did the embroidery and then cut out the fabric. This way, my fabric was big enough to stay in the hoop to do the embroidery. You'll also notice that I used a snap as my closure on this one. Now that I've tried that, I think it's my favorite way to close this up. So, I encourage you to give it a try! I also sewed the pockets out of fabric for this one. For each row of pockets, I cut a strip of fabric 4 1/2" by 5 1/2". I folded it in half the long ways, so it measured 2 1/4" by 5 1/2" with the right sides together. I sewed a 1/4" seam along the long raw edge. After sewing, I turned it right side out and pressed it so that the seam was along the bottom of the pocket and the folded edge was at the top. I repeated it for the other set of pockets. Then, I attached them the same way that I attached the lace in the tutorial. If I had it to do over again, I might make these pockets a little shorter....I might start with a piece of fabric that is only 4" or maybe 3 3/4" wide. Just a thought. You will notice that I didn't have a big enough piece of the pink fabric to cut out the front flap piece. So, I pieced what I had onto another fabric. It worked great and turned out cute! Sweet Pea liked this one so much, she decided to keep it. She gave her other one to a friend of hers on the school bus, who also has a DSi and with whom she swaps games now and then. It was very cute. Well, I hope you enjoy the tutorial and that you like these adaptations to the pattern. If you decide to make it, I would love to see what you do! Please post photos of your projects on my Flickr page, Mama Pea's Pod or on The Quilted Fish's Flickr page. And don't forget, Amanda is selling kits for the projects on her website! So, you can go there and pick up some fabric and goodies if you'd like! I would like to thank Amanda for the wonderful gifts she has bestowed on me and for the opportunities she has given me. I also want to thank my design team members for their inspiration, encouragement, and friendship through this process. And I want to thank Jill and Lynn again for all their help in editing and sewing samples! I hope you enjoyed this! I have had so much fun making it. I hope you do, too! Sweet Pea got up this morning and complained that she really missed me while I was gone. My afternoon meeting got cancelled today, and it's her first day of spring break. So, I'm playing hookie from work and taking her out to lunch and bowling with friends. Should be fun! It’s Lynn again, aka Alamosa Quilter, finishing up my beading tutorial guest post for Stephanie. Today I’m going to show you some beading basics. To start, thread your needle with a double length of thread. Knot the ends with a single quilters knot. I am using some white beading thread on solid black fabric so that things will show up better in the photos. I should also mention that I took these photos on a partly cloudy day. The clouds were moving fast and playing peek-a-boo with the sun so the colors look a bit different in some photos than in others. Starting half a needle length from where you want to begin beading, insert your needle between the layers and pull the knot between the layers. Then go up to the top of the quilt. Take a very small stitch (that will be hidden underneath your bead(s)). This gives some added security to your initial knot. I put a bead and the needle next to the stitch for scale so you can see what I mean by “small.” If I was using black thread this stitch would be pretty much invisible even before it gets covered by beads. Now come back up to the top of the quilt just before your little stitch, so that the beads will cover your little stitch. Then load up your needle with beads. The number of beads you load at one time depends on how far you are going and what stitch you are doing. For this first stitch we are just going to lay them straight. I loaded about 10 beads on my needle. Lay them flat on the surface and gently tap them back towards the starting point to make sure that there is no loose bead thread sticking out the back. Put your needle straight down at the end of your beads. You don’t want to put the needle in at an angle because it may negatively affect how your beads lay. Bring the needle to the back of your project. Come back up a few beads from the end, right in the middle of the line of beads. I generally come up about 1/3 of the beaded length from the end. In this case, about 4 beads from the end. Pass the needle through these last couple beads again. Pull your thread through and you have just sewn your first line of beads. Load up some more beads and I’ll show you how to get a curved line of beads. Lay the beads on your surface in a curved shape. When you are happy with your curve, put your needle straight down to the back at the end of the last bead in your curve. In most cases, this will cause your beads to jump up from the surface as the ones in the above photo did. Never fear! You are going to couch them into submission. Force your beads to lay back down on the surface and bring your needle up on one side of the beaded thread at the top of the curve. Pull the needle up and put it back down on the other side of the bead thread. Pull the needle and thread back down to the back. The little couching stitch should be hidden between the beads. To do a loop of beads, just bring the last bead around to the first bead and go back down to the back as close to where you came up as you can. Then couch the loop down. You may need to couch it in a couple places to get them to lay the way you want. Due to the way they are made, bugle beads can be sharp on the ends and there are often a few damaged ones in every purchased package. In the photo below I drew arrows toward the two damaged ones I poured out. You may need to click on the photo to enlarge it to be able to see the damage. Because bugle beads usually have sharp ends they can cut your thread over time. To use bugle beads safely, you should always place a seed bead at the beginning and end, to protect the thread. Load up a seed bead, a bugle bead, then a seed bead on your needle. Lay them flat on your surface and put the needle straight down to the back at the end of the line of beads. Bring the needle up between the bugle bead and the last seed bead. Take an extra stitch through the last seed bead. Again put the needle straight down to the back of your work right at the end of the bugle bead line. The last stitch I will show you is how to make beaded fringe. Come up from the back of your project where you want the top of your fringe to start. Load the beads you will make your first strand of fringe with on your needle. I used a blue bead on the end for clarification since this bead is the key to making fringe. Lay the beads flat on the surface of your work, but separate the end bead (the blue one) from the rest. Put your needle back through all of the beads, except the last one (blue one). Pull the needle through all the way along with all the excess thread. You may have to fiddle with the beads a bit to do this, but be patient, it will all work out. Insert the needle back into your fabric right where you came up to begin the fringe. Pull the excess thread to the back and you’ve made the first strand of fringe. It will stand up. Repeat the fringe step as many times as you want to make fringe. This looks great hanging down off the bottom of a quilt. You can make the individual strands as long or as short as you like. So that’s it for stitches. Now how do you finish? Take your needle and excess thread to the back of your project. I will show you two ways to finish depending on whether you are going to back your project or not. If you are beading on just your top and batting (or felt or flannel or some other layer) and will back your work when you are finished then you don’t need to worry about hiding knots. Take a small stitch, just through the batting layer. Pass your needle through the loop of the stitch. Pull the thread tight creating a little knot stitch. Then clip your threads leaving a generous 3” or 4” tails. With these tails, tie a knot. I usually do this twice. The beading thread is kind of like thin dental floss and has a tendency to misbehave. After you have spent all that time beading, you definitely don’t want the threads to come loose and beads to go every where. Then clip the ends about 1/2” from the knot. Put your backing on and finish the edges as desired and you’re done! If you have already backed and bound your piece and you are beading as a final step, I still take a very small knot stitch on the back. Actually I do two of these. Then knot your thread near the fabric and put your needle between the layers. Pull the thread to hide the knot between the layers and then clip your threads. When beading as a final step you can travel between the layers to hide some of your stitching. For added security you may want to stop and tie off then restart in a new area instead of traveling very far. This way if the beading stitches come loose in one area later on, the problem will be contained and easier to fix. If you do travel, be sure go through the last couple beads twice and take a small knot stitch on the back at the end of the first beads, travel between the layers to the next area, then take a small stitch (up to the top and then back down to the back) that will be hidden beneath the next beads before continuing to bead. This will minimize the damage should your threads get cut later. Whew! That’s all I have for you today. Happy beading! Yesterday I showed you the Silk Radiance fabric I'm going to use for my March challenge with Lynn. Well, I told Lynn, I'm pretty sure that faric is going to require some sort of bling...perhaps beads. And Lynn does a lot of cool beading on her quilts. So, I asked her for some advice, and I asked her if she'd be willing to do a guest post on my blog about beading on quilts. She was kind enough to agree and then blew the doors off it by doing a two-part post! She is here today to tell you about beading on quilts. Come back tomorrow for Part Two, where she demonstrates some actual strategies for attaching beads on quilts. Thank you so much, Lynn, for all the great information! I am indebted to you! I hope you--all my blogging friends--find the information Lynn provided as helpful as I did! Visit her blog sometime and surf around. Check out her quilts that she's beaded and buttoned. I love her hand stitching on her projects, too. I value my blogging friends so much and for many reasons, not the least of which is how much they teach me. Thank you again, Lynn! Hello everyone! Lynn here, aka Alamosa Quilter. Recently Stephanie asked me if I would do a beading tutorial for her. She wants to put some beads on a project. She suggested that as long as I’m doing a tutorial for her, maybe I should do a guest post for her. And here I am! We’ll start with some of the questions Stephanie sent me. Do you put the beads on before or after you quilt? I am thinking after, so that’s what the rest of my questions will assume. Answer: You can do either. If you are not going to quilt the beaded area then you can bead before quilting. You may even want to just layer the front and batting, then bead. Once you are done beading, add the backing and quilt as desired. This will hide your beading stitches. Otherwise, just layer and quilt as normal and bead after you have quilted. You will want to hide your beading knots between the layers in this case. Stephanie: What type of thread and needle do you use? I have used beading needles, which often are necessary to fit in the holes of the beads. But are they strong enough to get through the fabric? Answer: I recommend beading thread. This is typically a nylon thread. The reason is that some of the beads can be sharp and may cut regular cotton. You can use any needle that will fit through the hole of your beads. I usually use a quilting needle, a between size 10 or 11. I have never used a beading needle. Some people use the very fine appliqué needles, called straw needles. These are longer than is comfortable for me though. The thread I use comes on these little bobbins. It isn’t expensive – about $1.50 per bobbin. It comes in a few different colors. I have white, black and gray. In general, I match the thread to the fabric I am beading on. For black fabric I’d use black thread. However, for clear beads I’d probably stick with white. Stephanie: What types of beads do you like to use best? How do you decide where to put the beads? Answer: Mostly I use glass seed beads and bugle beads. They come in a variety of sizes. I seem to prefer the look of the smaller ones for some reason, not sure why. Put them where you want some extra sparkle or any where you want to accentuate. The beads are just another surface design feature. You can sprinkle beads sparsely across the surface to accentuate certain areas, like in the photo above. Or you can group them for major impact, like in the photo below. For these beaded flowers I used the design on the fabric below. I carefully cut out the design I wanted and fused it to my background fabric then beaded over the design. It was my first major beading project and took a while to complete, but I love it. I keep my beads and beading threads in this old loaf pan. I buy beads when I see them without worrying how I will use them. Stephanie: Do you have any tips or secrets to offer? Have I forgotten to ask something that you think is important for this? Answer: I recommend a good beading book for inspiration and fancy stitching instructions. I have “Beading on Fabric: Encyclopedia of Bead Stitch Techniques” by Larkin Jean Van Horn. There are other good books too. This is just the one I own. It has a spiral binding so it lays flat when open which is really nice. The book contains lots of good information about types of beads, some basics on how to bead, and such. Here is the table of contents. The other thing to keep in mind is that beading is not a fast technique. I love the effect beads can give a quilt, but it can take a lot of time if you use a lot of beads. I am “process oriented” not “project oriented” so finishing quickly is not usually something I consider for an art quilt. “It takes as long as it takes” is my philosophy with art quilts. I do not recommend putting beads on a bed quilt and definitely not on any quilt that will be used by a child. In part two I will show you a few beading techniques and stitches along with tons of photos for each step.